While last weekend saw the release of both The Hitman's Bodyguard and Logan Lucky as well as the continued roll out of buzzy indie Wind River this weekend saw the release of nothing major sans the faith based All Saints starring John Corbett as well as Leap! a co-production between Canadian and French companies that was titled Ballerina when it was released in France and the United Kingdom late last year. Though we should probably have a review of Hitman's Bodyguard going up at some point as it just won its second weekend in a row there is no avoiding the fact this is a slow time on the movie release calendar. And so, rather than review a film we both that was rather mediocre (Bodyguard) Charles and I discussed the latest from Steven Soderbergh in our latest review, Logan Lucky. This is the film that brought Soderbergh out of retirement, back into the genre of fun heist action/comedies and assembled a cast that includes the likes of Channing Tatum, Adam Driver, Daniel Craig, Riley Keough, Katherine Waterston, Seth MacFarlane, Hilary Swank, and Sebastian Stan, Not too shabby. And yet, Logan Lucky only scored a measly $7.6 million debut weekend which was then followed this weekend by another $4.4 million which accounts for a drop of 42.5% and a current domestic total of $15 million after ten days in release. With a production budget of around $29 million this isn't great news for the Bleeker Street release, but worse is the fact that it deserves so much more. 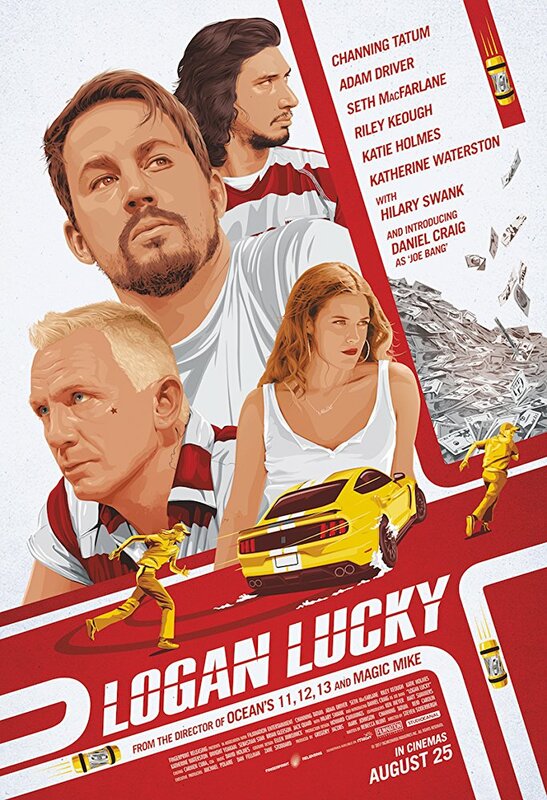 As I say in the video review below, Logan Lucky is one of those films one can re-visit time and time again simply because the characters in the movie are so much fun to hang out with. In short, more people need to hang out with these people-especially considering there are no major releases this weekend outside of The Weinstein Co. opening Tulip Fever in some 600 theaters and Sony re-releasing Steven Spielberg's Close Encounters of the Third Kind into around 700 theaters. There is a lot of good, smaller stuff at the movies right now, people! I'll be seeing Brigsby Bear, Good Time, and Ingrid Goes West this week alone as they've just all recently opened in my city and if none of those sound appealing-go see Logan Lucky! As always, be sure to follow the official Initial Reaction YouTube channel as well as on Facebook, Instagram, and Twitter where you can find a new review (or reviews) each week! Read my full Logan Lucky review here.